Definition at line 263 of file GVNExpression.h. Definition at line 268 of file GVNExpression.h. Definition at line 275 of file GVNExpression.h. References llvm::GVNExpression::ET_MemoryEnd, llvm::GVNExpression::ET_MemoryStart, and llvm::GVNExpression::Expression::getExpressionType(). Reimplemented in llvm::GVNExpression::StoreExpression, and llvm::GVNExpression::LoadExpression. Definition at line 284 of file GVNExpression.h. 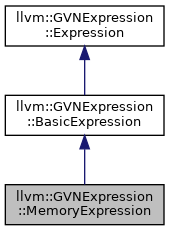 Definition at line 280 of file GVNExpression.h. Definition at line 292 of file GVNExpression.h. Definition at line 293 of file GVNExpression.h.